A group of Wilfrid Laurier University students is headed south for reading week, but they will be sporting safety boots rather than sandals. 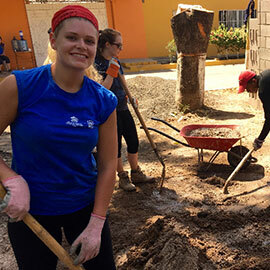 For the fourth consecutive year the university is undertaking a Habitat for Humanity trip to El Salvador, where participants will help build homes in the San Miguel area. Taking part in the trip, which runs Feb. 17-27, will be 26 Laurier students and Associate Professor of Society, Culture and Environment Robert Feagan. To take part in the trip, students raise the funds needed to cover the cost of their travel and make a contribution to Habitat for Humanity, a global charity that mobilizes volunteers and communities in building affordable housing and promoting home ownership as a means of breaking the cycle of poverty. While in El Salvador, students will contribute sweat equity to three homes, working alongside the homes’ future occupants as well as local tradespeople. Each year two students are charged with coordinating all aspects of the journey, from planning travel and accommodation, to on-the-ground transportation, job site safety, logistics and activities in El Salvador. Emily Loewen and Rachel Pearsell are the student leaders for the 2017 expedition. For Anna Fang and Kristina Simsic, student leaders from last year’s Habitat for Humanity trip to El Salvador, the experience is one that will stay with them for years to come. Students spend long days labouring in the sun, but there are activities planned that allow them to experience the culture, history, cuisine and architecture of El Salvador. Throughout the 2016 trip, Feagan led students in reflection exercises, which Fang and Simsic found important. “It was helpful,” says Fang. “It made me reflect on my thoughts and experiences. It’s really hard to put into words what this trip means. I started to realize how much satisfaction community work brings."